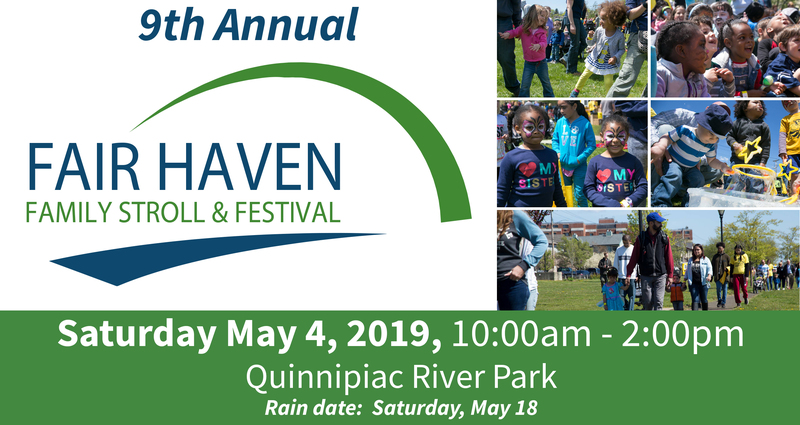 The Fair Haven Family Stroll is a festival and fundraiser to increase awareness about the importance of high-quality early childhood education while highlighting family-friendly resources in the Fair Haven community. Held annually since 2011, the Fair Haven Family Stroll has been a tremendous success, bringing together hundreds of adults and children with community-based organizations and service providers. Generous philanthropic sponsorship has come from organizations such as Friends Center for Children; United Way; Trust for Learning; Alfresco Landscape and Design; Brewery Square; Webster Bank; Carmody Torrace Sandak & Hennessey LLP; Tyco Printing; Eder Family Foundation; Elite Property Services, Inc.; GHP; Parrett, Porto, Parese & Colwell, P.C. ; and T.M. Byxbee Company. All families are invited to enjoy our celebration, Saturday, May 4th, 2019, from 10 am to 2 pm. With a suggested donation of $10, families can help meet an urgent need for increased access to quality early childhood education. Registration begins at the welcome tables at 10 am at the entrance to Quinnipiac River Park at the corner of Front St. and Exchange St. The event starts with families walking along the 1.5-mile loop around the Quinnipiac River—over two bridges and through the historic riverfront district of Fair Haven. After the stroll, the festival activities begin: drums, parachute play, puppets, face painting, food vendors, ballet, bubbles, yoga, arts and crafts, and a whole lot of door prizes. Hand in hand with the entertainment is valuable information from over 35 community resources partners in the area, each highlighting resources available to families in Fair Haven and greater New Haven, from health clinics and healthy food to literacy to safety. As a fundraiser, the Family Stroll helps increase access to high-quality early childhood education through donations, sponsorships, registration fees, and pledges—contributions that empower Friends Center for Children and Elm City Montessori School to serve more families in the community. In the case of inclement weather, the rain date will be May 18th. 11:20-11:30 Dance performance from S.W.A.G. What a great idea! Engaging Community in supporting Early Childhood Education is so important. Our future has a better horizon. Thank you! The Fair Haven Family Stroll & Festival spotlights the urgent need to increase access to high-quality early childhood education. In the New Haven area, for every 100 families looking for an infant/toddler slot, only 2 slots are available. For preschool slots, the number is better (46 of 100), but of these, only 61% leave the programs ready for kindergarten, reducing the number of high-quality slots to 27. The cost of high quality care (ranging from $1,200 - $1,800 per month) further decreases access. Studies by Nobel laureate and early childhood education expert James Heckman show that early childhood education has the HIGHEST rate of return on each dollar invested when compared with all other stages of education.